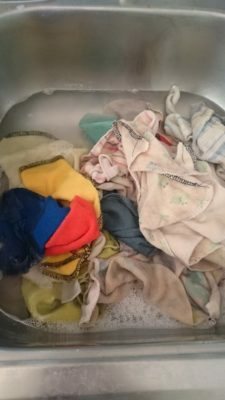 When I started cloth diapering my son around 3 months old, I had no intention of using cloth wipes. It seemed complicated to me and was one more thing I just didn’t need complicating my life as a new mom. Then when my change table area started to get really stinky, I knew I needed to do something! I found a friend who wasn’t doing it in a complicated way and she showed me how. You don’t need a ton of crazy products and it doesn’t have to be difficult. 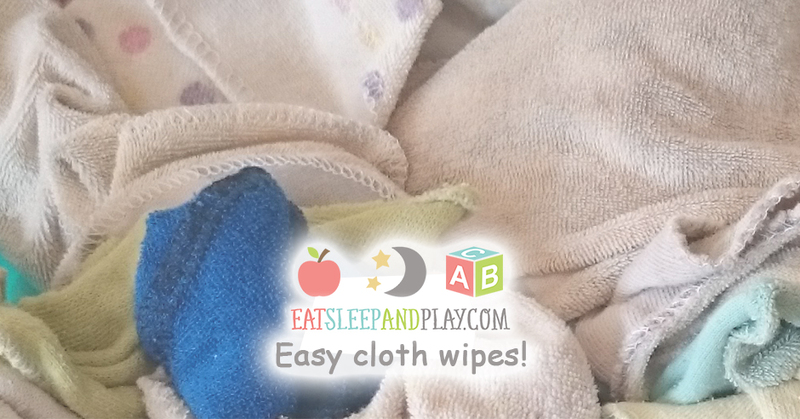 Pee cloth wipes can go right in the bin and poop cloth wipes can be rinsed with the diapers. 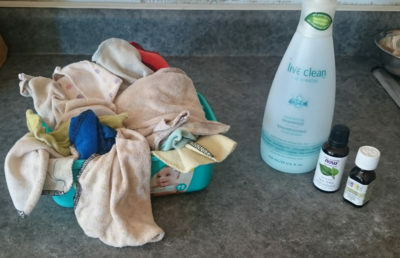 This completely eliminated the smell for me and we are back to blissful stinky free cloth diapering. I am all about low maintenance and easy living so i’m going to make this simple for you. No one has time for complicated routines! 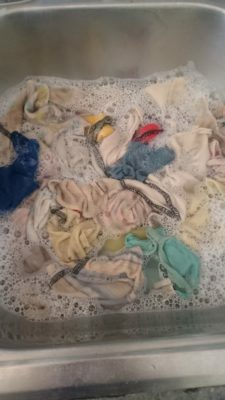 First I gathered a ton of baby wash cloths. All together there are probably about 40 or 50. To be honest I have never counted them, not even for this post. I find that I refill the container once a week or so. We use them at home exclusively but you can take them out with you as well. I wasn’t into making some crazy wacky solution that took time and money. No. Just no. I have so much stuff on my plate as a mom as it is. So I kind of experimented with my own ‘solution’. I use my kitchen sink because it’s smaller. I run the water enough to cover the wipes. I use pretty warm or hot water. As the water is running I use about 3 or 4 squirts of baby soap, baby shampoo or whatever I can find that works on my son’s sensitive skin. Then I pick my scents. Lavender oil is great for soothing those sore bums and tea tree oil works as a fantastic disinfectant. I use about 10 drops of each oil. As you start to work with the mixture you will find the amount that works best for you as well. Water types are different and I find that will affect your mixture as well. That’s it for the solution! Dump the wipes in and swish them around a lot. Get them really mixed in with the oils and soap. 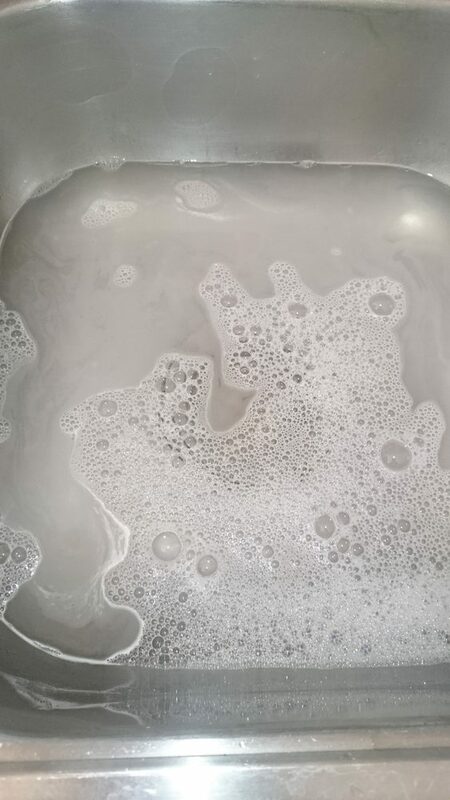 By this time my child is probably looking for me so I usually let them sit in the sink for a few minutes. Or half an hour. No rush! When I have time again I will come back and drain the water. Squeeze the cloth wipes out and then fold them in half stacking them in the container. I use an old pampers container I had for my disposables. I suppose a glass container or ziplock container would also work. I also clean out the container each time to prevent mold. I haven’t had an issue in the almost two years I have been using them but in the summer I worry about the humidity. That is IT! Use and then put them in the bin with the diapers. Rinse them out with the poop diapers and you are golden. No stinky disposable wipes, no poop smell and savings savings savings! I still buy disposable wipes to send to daycare and when we are out of the house but I have to make the trip maybe every few months now instead of every few weeks. Here are the products I use to make this all happen!